This will be a relatively short post, since I think the facts here speak for themselves. Basically the roots of the Spanish "problem" are undoubtedly many and complex, but there is one underlying ingredient in the present dynamic which more or less governs everything else: the dependence on external financing due to the ongoing current account deficit, and the difficulties the banks have had raising this external financing since the outbreak of the "financial turmoil" (aka as the US sub prime crisis) in August 2007. Following the difficulties which arose in the global wholesale money markets in the wake of the "August troubles" two countries - Spain and Kazakhstan - found themselves in a virtually unique (and unenviable) situation: the doors of the global money markets were slammed tight shut in their faces. 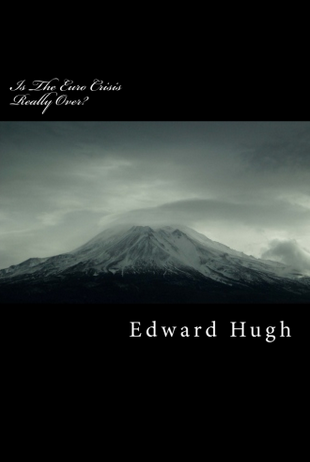 Since September 2007 both of these countries have, each in its own particular way, struggled to handle the aftermath of what effectively amounted to "financial armageddon". Astonishingly, after mountains of words have been written, and hours and hours of radio and TV talk shows and "turtullias" have been held, this simple detail about the Spanish situation remains obscure to the the majority of the Spanish people (and indeed, equally incredibly, the majority of Spaniards still don't have the faintest idea what cédulas hipotecarias actually are). So at the heart of the current problem in Spain lies, not the fact that 12 month euribor interest rates went up somewhat, which they did, and which was (of course) an aggravating factor, no, the real reason that Spain now has around one million empty properties waiting to be sold (apart from the fact that there seems to be no switch here to "shut off" the construction industry when it produces products for which there is no market) is that the Spanish banks have been unable to raise sufficient money to provide the mortgages that are needed to enable people to buy them (or better said they are unable to raise the money at prices which make the mortgage business a profitable one for them). And what better example of this than what happened in August 2008. According to the latest (provisional) data from the Bank of Spain, Spanish banks lent 33 million euros LESS to Spanish households in August than they did in July. After years when the banks were lending between 8,000 and 10,000 million euros a month, this situation, I think, counts as what people in the technical jargon of the trade call a "sudden stop". 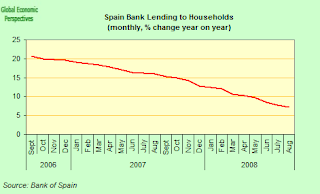 The whole Spanish financial system seems to have seized up in August. Even lending to non-financial corporates - which had been increasing during the boom at the same rate as to households - virtually dried up, with only 523 million in additional lending. Of course, such lending has been slowing steadily since August 2007 (see charts below). 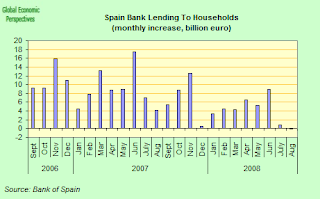 This is not the first time bank lending to households has ground to a halt during the current crisis, back in December 2007 new lending was only 561 million (see chart below), but this time the situation looks much more serious, and even definitive, since in the intervening period the economy has simply deteriorated and deteriorated. The principal reason why Spanish banks are so short of money to lend is the size of Spain's external current account deficit. Running at around 10% per annum, the deficit means that Spain needs to find roughly 7,000 - 8,000 million euros (7 to 8 billion) a month to settle the account. 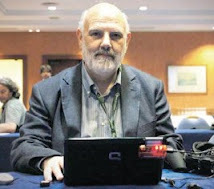 Unless external lenders step in and provide funding (by buying cedulas, or Spanish government debt, for example), the Spanish banking system keeps gasping for air, it suffers from a chronic lack oxygen in the bloodstream (and each month things simply get worse) in the form of new money to lend to oil the transactions flow. This is what having a "financial crisis" means when you come down to the nitty gritty of things. Actually the size of the deficit has come down since the early months of this year, when the monthly deficit was more like 11,000 million euros, but this "improvement" has been due more to a reduction in the value of imports (due to collapsing internal demand and lower oil prices) than to an increase in exports (both goods and services exports were effectively stationary in August year on year, and as the global economy enters recession this is hardly likely to improve). 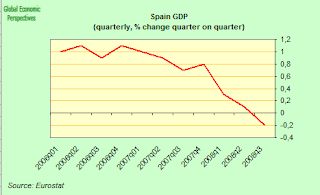 Another factor which it is very important to bear in mind is that the deficit on the income item in the monthly current account (basically the difference between what Spanish residents receive from money lent abroad and what Spanish residents pay to external lenders) has been rising notably of late, as both the volume of debt and the cost of serving it, ie interest rates, have risen. 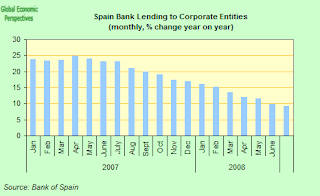 The financial account has also deteriorated recently, with the "other investment" heading (basically the balance between loans people outside Spain make to Spain as compared with loans people in Spain make to the rest of the world) turning strongly negative in July and August after very robust performances in February and March. So, effectively, the whole system is now folding in on itself, and the consequences are not hard to see. GDP slows and then contracts, more than likely in a pretty violent fashion in the not too distant future. Well, I said this would be a relatively brief post (although I hope there is a lot of meat here to chew on). 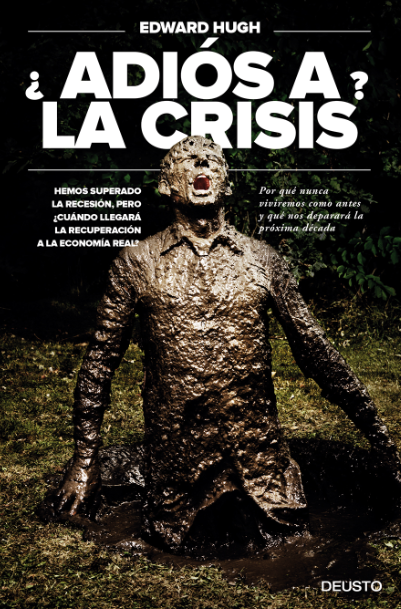 I think this is the core of the Spanish crisis in a nutshell. To better understand how it all works out in practice across the real economy you will need to dig around in my earlier posts, and to understand the implications of what all this will mean as we now move forward, well, naturally that will form the substance of the posts which are now to come.